“Come and look at this,” my father said with a tone in his voice I recognized as meaning it was something interesting. I walked over to our kitchen table curiously. He had a book. It was actually a huge book and leather-bound. “It’s a bible,” explained my Dad. 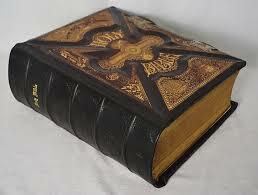 It was a large and heavy, black, leather-bound bible. It looked quite old too. The inside cover of this huge family bible was written in and once I got used to the old fashioned hand writing, I realised it was a four generation family tree. Did it mark the path through the family that this bible had taken? As if answering my mental question, Dad told me that the Bible had been acquired in the 17th Century and passed down through several generations of the family. That family was now extinct. It had died out with the recent death of the old lady who had given Dad this bible for safe keeping. I found this bible fascinating. It’s age, the smell of the paper, the strange typeface used, the binding and leather cover that was embossed in a strange design. It was a mysterious book in many respects. We examined the book for quite a while and then my Father packed it in paper and took it up to the attic where it would stay at least for the time being. We thought nothing more of that bible. In the days and weeks that followed, strange things began to happen in the house. It started with creaks and groans, unexplained bangs and crashes from the attic. “Just the heating and cooling of the rafters,” my Dad told us reassuringly. But things didn’t improve and if anything, steadily got worse. Nights were filled with strange sounds and sudden crashes that woke us all up. Added to some of the other things that I was experiencing at the time, it meant I hardly slept through fear. I would lay there waiting for the sounds to start and then when they did growing more and more jumpy and afraid as they continued through the night. Unfortunately however, other sounds began to emerge from the attic. Deep sighs that sounded as if the most depressed person you had ever met just let out their last death rattle. Then there were the slow, dragging footsteps punctuated with those horrible deep sighs of despair and followed by a few more footsteps. I wasn’t the only one hearing these sounds every night and I met my father on one or two occasions armed with flashlight heading up the vertical pull-down ladder into that little square hole in the roof at the top of the stairs. He was investigating those sounds although mostly he just muttered something about me getting back to bed. The sounds were truly scary. Imagine if every night it sounded like some one or some thing was slowly moving around your attic amongst crashes and creaks, sighs and groans. The hairs stood up on the back of my neck hearing those sounds as the cold hands of fear seemed to clasp around my neck slowly strangling me. As abruptly as they started, they stopped. I noticed almost immediately and finally slept. No noises that night nor the next or the next. In fact, the noises were gone and never returned. It was only several years later that I happened to be talking to my Dad about the noises that an explanation emerged. “It was that bloody bible I am sure of it,” said my father somewhat to my surprise. “Bible? you mean that big family bible you showed me that day?” I asked. “Yes, that one. It always did give me a bad feeling and that family never really liked us so I had wondered why we were given it. One night, I went up in the attic and found the damn thing. I took it down, placed it in one of those old biscuit tins and then the next day, I buried it at the bottom of the garden. Seemed to work,” he added looking at me with a grin. Who knows if it was that bible or what the sounds really were but one thing is for sure, if you one day happen to dig up an old biscuit tin that contains an old leather family bible, throw it away as quick as you can. If you enjoyed this story you will also like my novel – The Last Observer. Its on offer right now on Kindle.